Afrique du Sud Backpackers (old St John's Lodge- est.1989) is one of the oldest in Cape Town and is the best-positioned seaside Lodge in Cape Town. It nestles comfortably between the Atlantic Ocean and Lion's Head and has the city and Waterfront on one side and the renowned Camps Bay and Clifton beaches on the other. All these attractions are easily accessible by buses, mini-taxi's and Rikkis. The sea, promenade and an Olympic size seawater swimming pool are close by. Even closer are an abundance of banks, shops, supermarkets, cafes, bars and restaurants. 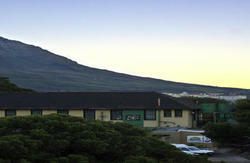 Those staying at Afrique du Sud love its friendly, family feeling. Once you have stayed there, you become part of the family - its a really great feeling. A small, cozy bar, barbeque, two balconies and 2 lounges so you will always find a peaceful spot to chill out in after a hectic day/night out on the town. Its different from most hostels because most of its rooms are single, double and family, with two dorms, so you are guaranteed your own space. Dave and staff are passionate about Cape Town and all it has to offer and want you to feel the same way, which is why they go out of their way to arrange the activities that suit you best. From car hire to overland safari's, shark diving to whale watching, 1-day tours to 56-day tours, they will gladly arrange them for you. Very affordable airport transfers offered. Recommended by Lonely Planet, 2004 edition, page 488 (under previous name, 'St John's Lodge'). Member VIP Backpackers Resort International. 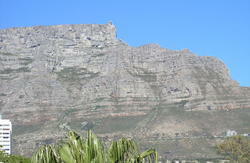 Member Cape Town Tourism. All student cards welcome. To secure your booking, you will receive an email from Afrique du Sud requesting the 3 digit security number on the reverse of your credit card. Reception is open 8am until 8pm. If you expect to arrive outside these hours contact Afrique du Sud directly to make arrangements. Coming into Cape Town either on the N1 or N2 (they converge), take the M6 (beach road) until the traffic lights at St John's Road (~3km), turn left, and we are on the next corner- look out for the blue and white building (see photo). Or, we can arrange a shuttle to meet you at the airport.